One of the most significant ways to recognize outstanding contributions to the potato industry and to our organization, The Potato Association of America, is the awarding of Honorary Life Membership (HLM). This is the highest award bestowed upon an individual by the PAA. Each year at the Annual Meeting of the PAA this award is given to deserving individuals and is considered by many attendees the highlight of the banquet. Bob has been around potatoes his whole life except for time he served in the U.S. Army with two of those years spent in Okinawa. He grew up on the family farm in Teton Valley, Idaho. His college of choice was Utah State where he received two degrees, a BA in English and a BS in International Agriculture with an Agronomy emphasis. Upon his Utah State graduation in 1973 he applied for admission and was accepted to graduate school in the Plant Breeding Department at Cornell University . For his Master’s degree, he studied Pathology and his master’s thesis was an analysis of the mode of resistance to cyst nematodes in four wild species. His doctorate thesis was a study of tuber yield and male sterility in reciprocal cross hybrids of North American tuberosum varieties and tetraploid cultivated South American varieties. He completed his PhD in Plant Breeding from Cornell in 1978. Later in 1978, Bob and his family relocated to Cochabamba, Bolivia working for USDA on problems of potato production in that country. In that period of time he was also able to aid in a potato germplasm collection effort initiated by the USDA gene bank in Sturgeon Bay, Wisconsin. He participated in several expeditions and one of the new species discovered was named in his honor, Solanum hoopesii, a tetraploid wild species. When the USDA project was completed in 1982, Bob and his family moved back to Cornell University as a Research Associate. 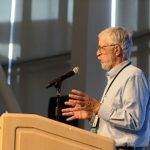 Dr. Plaisted mentioned to me that Bob Hoopes was very helpful and impactful the five years they spent together in the Potato Breeding program and mentioned that Bob was very supportive when Cornell hosted the 1986 PAA Meeting. On June 29, 1987 Dr. Bob Hoopes was hired by the Frito Lay Company, as a Principle Scientist I Potato Breeder at the Research Center located in Rhinelander WI. As the Potato Breeder, Bob was the core leader of the “potato innovation” that has occurred in the Frito Lay/PepsiCo program for nearly 30 years. His breeding concepts that he introduced early on at Frito Lay laid the foundation for multiple potato varieties making their way to commercial use across North America as well as PepsiCo’s international regions across the world. I don’t know of another potato breeder anywhere in the world who has developed new varieties that have reached the commercial scale of those that Dr. Hoopes developed in terms of count, acres, and growing regions. His accomplishments are truly remarkable and have had significant impact on advancing the potato industry forward. His varieties have impacted 3 major changes in the potato chip business over the past 30 years. Dr. Knowles is a Professor and Past Chair at Washington State University (WSU) in the Department of Horticulture. Dr. Knowles has made positive impacts on the potato world by researching and developing solutions to physiological issues unique to the potato industry. His research accomplishments include elucidation/development of mechanisms of age induced deterioration of seed quality and productivity, oxidative metabolism involved in critical wound responses, metabolic markers of seed-tuber age, methods to estimate and manage yield potential of seed-potatoes, novel sprout inhibitors and management practices to optimize yield. Dr. Knowles has also investigated cold temperature sweetening of stored potatoes, manipulating tuber size profile, influences of nutrient on potato growth and development, plant growth regulation, and many others. Dr. Knowles began conducting potato research in 1980 as a PhD graduate assistant at Washington State University, under 1987 PAA HLM recipient, Dr. Willie M. Iritani. Rick began his academic career at University of British Columbia as Assistant Professor in 1983. In 1986 he was hired at the University of Alberta. He received tenure in 1988 and was promoted to Professor in 1995. In 1999, Dr. Knowles was hired as a Professor of Horticulture at WSU, Pullman, WA, where he remains today. Dr. Knowles is highly driven by physiological challenges created through imperfect potato quality and production. He approaches challenges intelligently with dedication, employing an incredible work ethic. Through his position at WSU, he holds several US patents pertaining to a potato sprout inhibitor, commercially sold as ‘SmartBlock’®. Dr. Knowles has assisted in developing 47 potato varieties through the Northwest Potato Variety Development Program (Tri-State). One of these varieties, Clearwater Russet, is now grown on more than 21,000 acres across the US. Dr. Knowles research prowess has been quantitatively recognized by grants awarded to him and his cooperators (approximately 76 since the year 2000). During his time in academia, Dr. Knowles has brought in over $10 million in grants to support his research, employees, and students. This accomplishment is impressive by any standard and reflects the high level of his research accomplishments which are also supported by the publication of over 100 refereed journal articles, along with several invited book chapters. In addition to the American J of Potato Research, He has authored research papers in a broad range of highly respected journals (Planta, J Plant Growth Regul, Plant cell, Plant Physiol Biochem, Archives of Biochemistry and Biophysics and others). All of these are huge contributions to potato science, the PAA and the industry, but they are also quantitative indications of invitations to collaborate with other leading scientists. Clearly these collaborations and accomplishments demonstrate Dr. Knowles stature in the international research community. 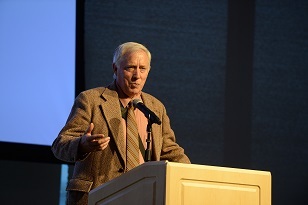 Steve Love grew up in the same area of southeast Idaho where he has made his career in potato research. After earning his bachelor’s degree in 1980 at Brigham Young University in Provo, Utah, he took a direct route to a Ph.D. in plant breeding at Clemson University in South Carolina, completing that in 1984. He then did a post-doc at Clemson and in 1985 headed to Aberdeen, Idaho for work at the Agricultural Experiment Station where he started as an Assistant Professor. He also served as the Experiment Station Superintendent for many years. He attained the rank of Professor in 1998. Growing up in a rural area and working at an experiment station in the heart of potato country put Steve in touch with the day-to-day problems of potato production. Steve had developed “farm boy common sense” which he was able to combine with his academic knowledge. That gave him the tools to focus on the main issue in a research problem, while having the scientific curiosity to expand the research objectives when needed to answer unique problems. The start of Steve’s work in potatoes matched the start of the tri-state potato variety development program. As such he worked closely with cooperators in Washington, Oregon, and Idaho, but those efforts naturally included other western states such as Colorado, California, and Texas. His colleagues in those states have benefited from Steve’s collaborative approach. Steve was one of the main drivers of the early success of the Tri-state potato variety program. He has been involved in the development and release of more than two dozen potato varieties. He co-authored the Potato Production Systems book in 2003 which is used worldwide by industry and students. The second edition of this book is currently in review. Steve has authored or co-authored more than 30 journal articles on potato. He has been a sought-after speaker by the industry, including talks on the national level and international at the World Potato Congress in 2006. Steve was the committee chair for six graduate students in potato with those people going on to make an impact in both potato industry and academia. His most recent service on a graduate student committee just ended, but his expertise in potato was still needed, even though his university assignments have taken him away from potatoes. 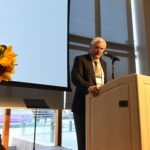 He was also the chair of the mentoring committees of five new University of Idaho faculty members. His letters of support for this nomination come from a former student, former employee, and two collaborators representing Idaho, Texas, and North Dakota universities and an industry processor. This just gives a “snapshot” of the reach of his influence. In the community Steve has been active in coaching cross-country runners over nine years, serving in the Boy Scouts in many positions for over 20 years and in the local Rotary Club for over 25 years. He has stayed active in anything to do with plants and people. He was the driving force in his hometown rose garden for the Rotary Club and has even worked to develop a short-season watermelon for the beautiful but short summers of southeast Idaho. His work assignment at the university changed to native plants and urban horticulture, but Steve is always ready to help with a potato question or problem. Steve’s work for the Potato Association of America has been productive. 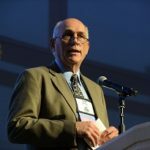 When you read the American Journal of Potato Research, with its revamped and revitalized format from the American Potato Journal days, you see Steve’s work. He served as chair of the PAA journal format committee that put out the first issue of AJPR in January of 1998. He also served on many PAA committees: Graduate Student Awards, Variety Handbook Committee, Honorary Life Committee (Chair), Outstanding Paper Award Committee (Chair), and others. He served as a Director, Vice President, President-Elect, and President of PAA with service in these offices spanning from 1994 until 2000. His wife, Moniquita has been by his side at many of the annual meetings and together they’ve raised a wonderful family. Congratulations Steve and thanks for all the wonderful work you have done for potatoes and this organization. Experiment Station, Aroostook Farm, Presque Isle, Maine. He led the field research program of Professor Hugh Murphy until Hugh’s retirement in 1985. During that time Leigh participated in a wide range of potato research projects including studies on nutrient management, soil management, variety evaluation, storage practices, sprout inhibition, fry quality, weed control, vine desiccants, plant growth regulators, and soil inoculants. Leigh participated in all phases of the research program and supervised many staff members and students during this time period. He analyzed data and presented reports at grower meetings and scientific meetings including PAA and the Northeast Weed Science Society. Leigh was an author or co-author on published papers in the American Potato Journal, Proceedings of the Northeast Weed Science Society, and many other scientific and grower-oriented outlets. He also became a PAA member and maintained active PAA membership from the late 1970’s until the present. In 1986, Leigh left his research station job and took a Crop Specialist position with University of Maine Cooperative Extension. He worked for Extension for 10 years. During this time, he maintained a focus on applied research and educational programs involving soil management, nutrient management, weed control, vine desiccation, and variety development. He prepared and published Extension fact sheets on nutrient, soil, and pest management. He was active in national programs, as well as local, and he continued his active involvement in the PAA. While at the University of Maine Cooperative Extension Leigh was a leader in helping the industry contend with the new A2 strains of late blight. Leigh played an instrumental role in developing control strategies, including a late blight control video for the industry. Leigh was heavily involved with helping develop irrigation infrastructure in Maine and co- authored an irrigation guide. Leigh developed several internal information systems for tracking grower fields, inputs, storage location, and other pertinent information, which were crucial for full traceability of the crop. Leigh also led the sustainability initiative for McCain Foods which involved developing guidelines for practices, working with growers to implement practices, and documenting these practices to assure that the goals of the program and the purchasers were met. Leigh is truly passionate about his work with an unmatched skill set. Leigh is unique in that he has made very significant contributions to several facets of the potato industry, including research, education, production, processing and utilization. In all of his work, Leigh is forward-thinking and detailed- orientated with the ability to combine science with reality. He is creative and inventive, developing implements to use in field work, saving time and effort. In addition, Leigh is a tremendous mentor for the next generation and patient with all. Leigh has been a member of PAA since the late 1970’s. He has attended many, annual meetings and has presented papers to the membership at many of these meetings. Leigh has been an active member of the Extension section and the Production/Management sections over the years (including the current Extension, Production, and Management Section) and was also involved in the Utilization section. He served the organization as a section chair several times through his career. In 2006 Leigh became a Director on the PAA Executive Committee and held the role of President in 2013. He was a strong leader for the PAA and he led several initiatives that helped improve and modernize the PAA. Most recently Leigh stepped in to help when the PAA office in Orono was in transition. Leigh participated as a member of three PAA local arrangement committees (Presque Isle, 1984; Bangor, 1995; Portland, 2015). Leigh was the LAC Chair in 2015 when the annual meeting was hosted in Portland, ME. His attention to detail and strong leadership were a large reason for the success of that excellent meeting. Many may remember the wonderful lighthouse and potato centerpieces at the banquet that year. These centerpieces demonstrated that Leigh has an artistic as well as a scientific mind. Outside of PAA, Leigh has served his community, being elected to local municipal boards. For many years he was heavily involved with the Central Aroostook Soil and Water Conservation District, serving as a supervisor. He has served on different committees of the Maine Potato Board during his career. Leigh’s contributions to the potato industry have not gone unnoticed, he was the recipient of an award from McDonald’s for his pioneering work on what is now known as the Potato Sustainability Initiative. Leigh and his wife Patricia call Washburn and Arundel home. They have two grown children, Kate and Alex.